BiddyTarot is a top online provider of tarot card training and information. As founder, Brigit Esselmont has grown her coaching and training business over the past few years. Her site receives hundreds of thousands of visitors per month. 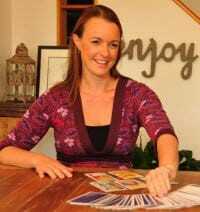 We worked together for about 9 months, and in that time, Brigit successfully launched three tarot training programs. Our work focused on helping her build an effective and profitable launch sequence for each of these three courses, and then creating a strong upsell path from one course to the next. In her first course, her improved launch strategies resulted in a 1900% increase in enrollments from the previous time she had offered this course. (In fact, we realized that her gained revenue from just this one launch paid for our coaching work many times over.) Brigit went on to launch the second and third levels of her training course with equally impressive results. Our work focused on profitability, income stream generation, and launching online courses effectively. I chose to work with Rachna as my first-ever business coach because I was ready to ‘step up’ and open the space for even bigger growth in my business and myself. Since partnering with Rachna, I have launched a killer marketing campaign for my signature 6-week online Tarot course with a record number of student enrolments (beyond my wildest dreams) and created two new products from already-existing products. Rachna is highly professional, focused and committed to helping me make the most out of my business, while also being personable, warm and encouraging – everything I want in a coach!